As the executive assistant for the Chattanooga (Tenn.) Neighborhood Enterprise, a housing nonprofit that focuses on homeowner education and counseling, Hannah Clark has to keep track of and account for just about everything. Donations and grants. Office supplies. Time. And until recently, the front door. Clark and the CNE team regularly get visitors coming in to pay bills, meet with counselors, learn about rental properties, and more. In late 2017, each time a visitor arrived, one of the already busy staff members would have to pull away to go greet and check in the latest arrival. At most resource-strapped nonprofits, employees often juggle tasks above and beyond their hired duties to help the organization run as lean as possible. With the rest of the staff in cubicles with no line of sight to the front door, a member of the accounting team sat near the door and acted as a receptionist, but it wasn’t her sole job. Clark eventually made her way to TheReceptionist.com and start digging further. After checking out some reviews of The Receptionist for iPad, Clark believed she had found the answer to CNE’s visitor check-in problem. “The Receptionist for iPad had the most positive things said about it of all the solutions I looked at,” Clark said. “I liked that everything came with it together and that the set up is almost as easy as just turning on the iPad. I liked that the interface could be edited from my computer and that the check-in buttons could be changed very quickly. 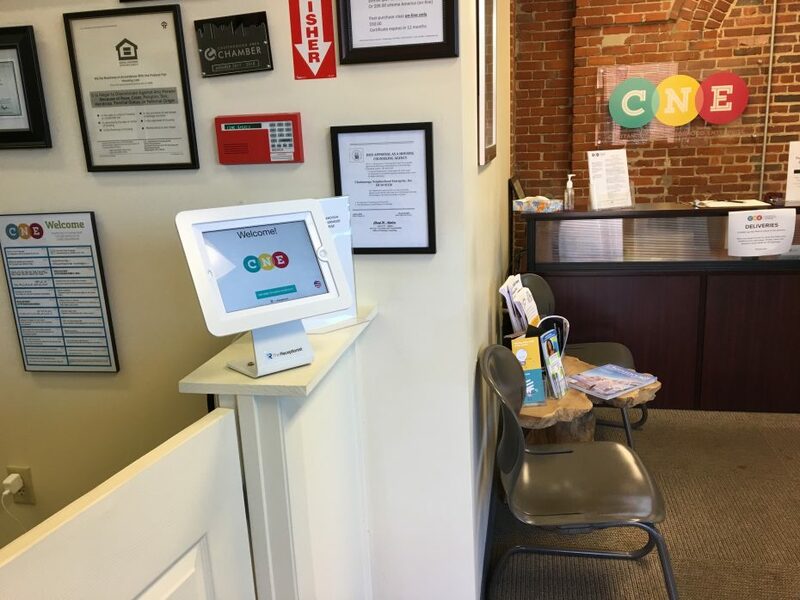 With The Receptionist for iPad in place, visitors are now greeted by a convenient and easy check-in experience, and the CNE staff no longer has to keep tabs on the front door. When a visitor checks in, the appropriate staff member is notified, and the visitor is assured that their presence in the office is known.